Let’s face it, the Buccaneers have become accustomed to self-destructive losses. Allowing teams to overcome deficits of all sizes, committing record numbers of penalties, defenses giving up big downfield plays, and offenses stalling mid-game. 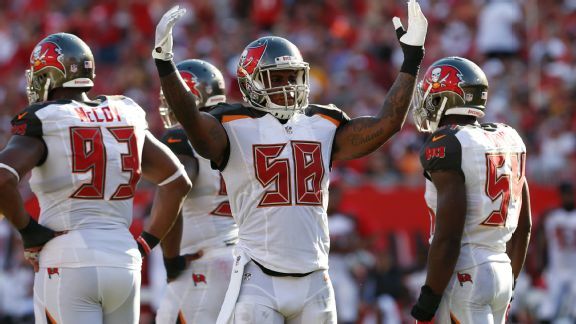 Second-year linebacker Kwon Alexander has received his head coach’s call for a culture change loud and clear. He says it’s time to turn things around when the Denver Broncos come into Raymond James Stadium. Kwon Alexander likes to play teams like the Bronco and believes that the big players make big plays in those kinds of big games. He suspects that is what Tampa’s big playmakers will do. Alexander got the ball rolling last week with a 38-yard pick-six on a pass intended for Tavon Austin but also understands that it’s going to take more than one big play here and there to start getting wins. Kwon Alexander and Jameis Winston had a talk about that, so the know they have to go out there and play hard. That type mentality has to be instilled in all the players on the team. Kwon understands that losing is not good, and hopes the whole team is of the same mind. A big reason why the Bucs have struggled over the last couple of weeks has been because of the huge plays the defense has been giving up. An issue that Dirk Koetter and Mike Smith have been very vocal about fixing. Nearly half the starting defense has either been named All-Pro or been to a Pro Bowl, plus young stars such as Alexander who’s tied for fifth in tackles and is likely on his way to a Pro Bowl as well. Kwon does not believe he is seeing that lack of belief coming from anyone on his team. He believes everyone on his team believes they can win and understands that even if they have lost a couple games that no one should worry. They will get there. They just have to keep the faith and keep grinding. Kwon Believes, fully, that Tampa will climb that mountain and feels that if someone on the team doesn’t believe in the Bucs, then they do not need to be on the team. Kendell Beckwith could prove to be another Gem drafted from LSU.